According to the U.S. Department of Health and Human Services, children between the ages of two and six years old should eat three servings of vegetables a day and older children should have four servings. 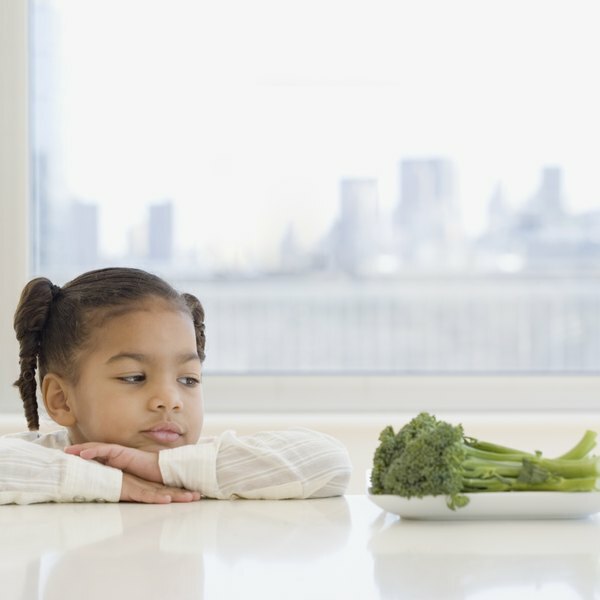 Getting finicky eaters to consume the recommended amount of veggies can be a struggle; even easygoing kids might balk at that number. One way to increase your child's produce intake is by sneaking them into other foods that they enjoy. Blend them in smoothies. Mix a banana, a cup of apple juice, a couple cups of shredded carrots, a cup of yogurt or milk and ice in a blender for a sweet, filling drink that kids will love. The Centers for Disease Control and Prevention states that 1/2 cup of raw carrots is a serving, so if you divide this between two children they will each drink two servings of vegetables. Puree vegetables for sauces. Many kids enjoy spaghetti with sauce, and it is a rare child who does not love macaroni and cheese. Take advantage of these preferences by adding pureed vegetables to them. Spaghetti sauce already contains tomatoes, but you can add pureed carrots and spinach for a vitamin-packed punch most kids will never notice. Add pureed carrots or squash for a healthier yet customarily orange cheese sauce to top macaroni noodles. Cover vegetables with cheese. Pizza is a childhood favorite, but your brood might balk if the pie is topped with big, chunky vegetables. Instead, chop mild-tasting vegetables, such as zucchini and spinach, into fine bits and place them directly onto the sauce of a homemade pizza. Top with cheese and bake as usual. Of course, you can add pureed veggies to the sauce as well. Mix shredded veggies into ground meat. North Carolina State University suggests adding grated or chopped vegetables such as carrots, sweet peppers and onions to meatloaf. In fact, you can add them to any ground meat dish such as hamburgers, sloppy Joes or meatballs. Use a food processor or blender to cut the vegetables as finely as possible. Bake vegetables in desserts. There are many sweet treats that children will love into which you can sneak a vegetable or two. Carrot cake, pumpkin muffins and zucchini bread are family favorites. Seek out other creative recipes as well, such as tomato soup cake and black bean brownies. Why Does Juicing Vegetables Cause Indigestion?